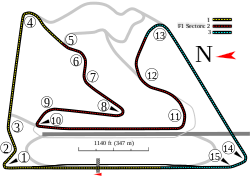 The Bahrain International Circuit (Arabic: حلبة البحرين الدولية) is a motorsport venue opened in 2004 and used for drag racing, GP2 Series and the annual Bahrain Grand Prix. The 2004 Grand Prix was the first held in the Middle East. Beginning in 2006, Australian V8 Supercars raced at the BIC, with the event known as the Desert 400. However, the V8 Supercars did not return for the 2011 V8 Supercar season. 24 Hour endurance races are also hosted at BIC. The circuit has a FIA Grade 1 license. The construction of the Bahrain circuit was a national objective for Bahrain, initiated by the Crown Prince, Shaikh Salman bin Hamad Al Khalifa. The Crown Prince is the Honorary President of the Bahrain Motor Federation. TRL was asked to build the circuit, headed by Patrick Brogan. Race organizers were worried that the circuit would not be complete in time for the 2004 Bahrain Grand Prix and attempted to cancel the event; however, Formula One supremo Bernie Ecclestone refused this request. In the end, the circuit was not quite fully complete, but was good enough for the grand prix to go ahead. After the 2004 race and ahead of the 2005 race the track was realigned at turn four, decreasing the circuit's overall length by 5 metres. In 2007 the circuit became the first Grand Prix circuit to be awarded the distinguished FIA Institute Centre of Excellence award, given for excellent safety, race marshal, and medical facilities, and for the high standards of technology required to maintain these. At the 2009 Grand Prix, BIC announced a collaboration with @bahrain to develop land next to the circuit. @bahrain is part of the Mumtalakat group of companies. @bahrain will dedicate more than 1 million square meters of business, entertainment and educational space with a value in excess of US$2bn (BHD 850million), making it one of the largest investment projects to take place in Bahrain in the past five years. In 2011 the circuit was scheduled to be the first GP of the season. However, due to civil unrest in the country the race had to be cancelled in March 2011. On early June the FIA announced that the race would be scheduled for 30 October, the original slot for the inaugural Indian GP, which would be shifted to a season-closing date on 11 December. However, two days later following concerns from teams and other officials, the race organizers officially cancelled the race, choosing to focus their attention on the 2012 running. The 2012 Formula One calendar had the race scheduled for 22 April, the fourth of the season. The circuit was designed by German architect Hermann Tilke, the same architect who designed the Sepang circuit in Malaysia. The main contractor for the project was Cebarco-WCT. The circuit cost approximately 56.2 million Bahraini Dinars (US$150 million) to construct. It has six separate tracks, including a test oval and a drag strip. The circuit posed a unique problem. Positioned in the middle of a desert, there were worries that sand would blow onto the circuit and disrupt the race. However, organizers were able to keep the sand off the track by spraying an adhesive on the sand around the track. The surface of the track is made of graywacke aggregate, shipped to Bahrain from Bayston Hill quarry in Shropshire, England. The surface material is highly acclaimed by circuit bosses and Formula 1 drivers for the high level of grip it offers. The same aggregate material is used at the Yas Marina Circuit for the Abu Dhabi Grand Prix. "Grand Prix Circuit". Used in F1 in 2004–2009, and since 2012. The DRS zone is on the pit straight at the Bahrain Grand Prix (starting 2012), so turn 1 ("Michael Schumacher turn") is the prime overtaking opportunity. The corner itself is incredibly tight; a typical F1 car must brake approximately 100 metres before the corner and shift right down to gear one. The width of the track further adds to the overtaking possibilities. Turns 2 and 3 are flat out and gaining a good exit can set up an overtaking opportunity into turn 4. The straight leading to turn 4 is very long with a DRS zone, and the track at the corner itself is incredibly wide, at about thirty metres. Turns 5, 6 and 7 make up a high-speed left-right-left "S" section that leads into turn 8, a right-hand hairpin where taking a wide line can avoid the bump on the apex which unsettles the car. Turns 9 and 10 are very challenging as they are two blind left-handers where cars must brake, downshift and turn simultaneously – they go from 205 km/h in gear 5 down to 63 km/h in gear 1 whilst trying to avoid locking up their inside front tyres. The back straight leads down into turns 11, 12 and 13, a medium-speed complex of corners. Turn 11 is a fourth-gear left hander that leads immediately into the flat-out right hander of 12, then the third gear right-hander of turn 13 which requires a good exit to gain speed down the following straight. It is worth braking quite early for turn 14 to gain speed down the main straight. If you brake about 100 metres before the apex then it is easy to keep it tidy through the slow right hander and you can also put the power down early, and gain speed all the way through turn 15 and the main straight (which is the DRS zone). The lap record (which only accounts for laps set in a race) on the current layout of the Grand Prix circuit was set in 2005 by Pedro de la Rosa at 1:31.447, in what was the only fastest lap in his 104-race career. Michael Schumacher set a faster time of 1:30.252 at the 2004 edition of the race, but alterations to turn 4 of the track meant that it was counted as a different layout from 2005 onwards. The fastest time ever set at the track was produced by Charles Leclerc during qualifying for the 2019 edition at 1:27.866, beating the previous record by Sebastian Vettel, set during qualifying for the 2018 edition (1:27.958). The Bahrain International Circuit hosts a number of high-profile series, including the FIA Formula One World Championship, the FIA World Endurance Championship, the FIA Formula 2 Championship, Chevrolet Lumina Series, Thunder Arabia and Radical. Also every year there is the traditional 24 Hours of Bahrain. In the past the circuit has hosted the FIA GT Championship, Speedcar Series, Australian V8 Supercars, GP2 Asia Series, and a one-off Bahrain Superprix involving Formula Three cars, following on from the collapsed Korea Super Prix. The first ever Formula BMW World Final took place in Bahrain. The first Bahrain Grand Prix took place on 4 April 2004, making history as the first Formula One Grand Prix to be held in the Middle East. Bahrain fought off fierce competition from elsewhere in the region to stage the race, with Egypt, Lebanon and the United Arab Emirates all hoping for the prestige of hosting a Formula One Grand Prix. The Bahrain Grand Prix is usually the third race on the Formula One calendar, apart from the 2006 season, when Bahrain swapped places with the traditional opener, the Australian Grand Prix, which was pushed back to avoid a clash with the Commonwealth Games. In 2009, Bahrain was moved to the fourth race. For the 2010 season Bahrain was again the season opener and Formula One cars drove the full 6.299 km (3.914 mi) "Endurance Circuit" to celebrate F1's 'diamond jubilee'. For 2011 however F1 was set to return to racing on the original layout used between 2004 and 2009. The race was postponed and finally cancelled due to protests in the country but F1 returned to the track for the 2012 Bahrain Grand Prix. 2014 saw the track host its first ever Grand Prix under lights, as the race was scheduled as a night race to celebrate the tenth year of Formula 1 at the circuit. Subsequent editions of the race have also been held at night. ^ a b c d e "Race Preview". FIA Communications Department. Archived from the original on 2 April 2016. Retrieved 3 April 2016. ^ "Bahrain 'tried to stop GP'". BBC News. 25 March 2004. Retrieved 13 April 2007. ^ "Bahrain named Centre of Excellence by FIA". Formula1.com. 13 April 2007. Archived from the original on 15 April 2007. Retrieved 13 April 2007. ^ "Jobs 'for generations to come'". gulf-daily-news.com. 26 April 2009. Retrieved 27 August 2009. ^ "F1plus: Bahrain Grand Prix reinstated; race will take place on October the 30th". F1plus.com. 4 June 2011. Archived from the original on 24 March 2012. Retrieved 4 June 2011. ^ "Cybarco takes on $155 million Bahrain F1 circuit". xak.com. 4 June 2011. Archived from the original on 15 April 2012. Retrieved 4 June 2011. ^ "Bahrain International Circuit". Archived from the original on 28 June 2012. Retrieved 22 July 2012. ^ a b c d "Bahrain International Circuit Info". Bahrain International Circuit. Archived from the original on 3 January 2007. Retrieved 17 December 2006. ^ "Schumacher admits sand fear". BBC News. 29 March 2004. Retrieved 13 April 2007. ^ "From Shropshire to Abu Dhabi GP". BBC. 30 October 2009. Archived from the original on 2 November 2009. Retrieved 30 October 2009. ^ a b c "Bahrain track guide". F1 Fanatic. Retrieved 19 December 2012. ^ a b "Car setups for Formula One". Retrieved 19 December 2012. ^ "In numbers - the Bahrain Grand Prix". formula1.com. Formula One World Championship Limited. 31 March 2016. Archived from the original on 3 April 2016. Retrieved 3 April 2016. ^ "F1 live: Bahrain Grand Prix 2019 qualifying - latest updates as Charles Leclerc takes pole for Ferrari". Telegraph. 30 March 2019. Retrieved 30 March 2019. ^ "LIST OF FIA LICENSED CIRCUITS" (PDF). Archived from the original (PDF) on 26 May 2012. Retrieved 22 April 2012. ^ "Sakhir reverts to old layout for 2011". ESPN UK. Retrieved 3 April 2016. Wikimedia Commons has media related to Bahrain International Circuit.